Tarsus (/ˈtɑːrsəs/; Hittite: Tarsa; Greek: Ταρσός Tarsós; Armenian: Տարսոն Tarson; Hebrew: תרשיש Ṭarśīś; Arabic: طَرَسُوس‎ Ṭarsūs) is a historic city in south-central Turkey, 20 km (12 miles) inland from the Mediterranean. It is part of the Adana-Mersin metropolitan area, the fourth-largest metropolitan area in Turkey with a population of 3 million people. Tarsus forms an administrative district in the eastern part of the Mersin Province and lies in the core of Çukurova region. With a history going back over 6,000 years, Tarsus has long been an important stop for traders and a focal point of many civilizations. During the Roman Empire, Tarsus was the capital of the province of Cilicia. It was the scene of the first meeting between Mark Antony and Cleopatra, and the birthplace of Paul the Apostle. Located on the mouth of the Berdan River (Cydnus in antiquity), which empties into the Mediterranean, Tarsus is a junction point of land and sea routes connecting the Cilician plain (today called Çukurova), central Anatolia and the Mediterranean sea. The climate is typical of the Mediterranean region, with very hot summers and chilly, damp winters. Tarsus has a long history of commerce, and is still a commercial centre today, trading in the produce of the fertile Çukurova plain; also Tarsus is a thriving industrial centre of refining and processing that produces some for export. Industries include agricultural machinery, spare parts, textiles, fruit-processing, brick-making and ceramics. Agriculture is an important source of income: half the land area in the district is farmland (1,050 km²) and most of the remainder is forest and orchard. The farmland is mostly well-irrigated, fertilised and managed with up-to-date equipment. The ancient name is Tarsos, derived from Tarsa, the original name of the city in the Hittite language, which was possibly derived from a pagan god, Tarku, as Hittites were one of the first settlers of the region. First mentioned in historical record in Akkadian texts of the Neo-Assyrian era as Tarsisi. During the Hellenistic era it was known as Antiochia on the Cydnus (Greek: Αντιόχεια του Κύδνου, Latin: Antiochia ad Cydnum), to distinguish it from Syrian Antioch. It was known as Juliopolis to the Romans, Darson in Western Armenian and Tarson in Eastern Armenian. Excavation of the mound of Gözlükule reveals that the prehistorical development of Tarsus reaches back to the Neolithic Period and continues unbroken through Chalcolithic and Early Bronze Ages. The settlement was located at the crossing of several important trade routes, linking Anatolia to Syria and beyond. Because the ruins are covered by the modern city, archaeology has barely touched the ancient city. The city may have been of Semitic origin; it is first mentioned as Tarsisi in Neo-Assyrian records of the campaigns of Esarhaddon, as well as several times in the records of Shalmaneser I and Sennacherib, the latter having the city rebuilt. A Greek legend connects it with the memory of the Assyrian king Sardanapalus (Ashurbanipal), still preserved in the Dunuk-Tach, called 'tomb of Sardanapalus', a monument of unknown origin. Anchiale, daughter of Iapetus, founded Anchiale (a city near Tarsus): her son was Cydnus, who gave his name to the river at Tarsus: the son of Cydnus was Parthenius, from whom the city was called Parthenia: afterwards the name was changed to Tarsus. Silver coin of Achaemenid satrap (governor) Datames, minted in Tarsus, dated c. 375 BC. Obv: The God Baaltars seated. Rev: Datames wearing Persian dress, inspecting arrow held in hands. Winged solar disk to the upper right. In historical times, the city was first ruled by the Hittites, followed by Assyria, and then the Persian Empire. Tarsus, as the principal town of Cilicia, was the seat of a Persian satrapy from 400 BC onward. Indeed, Xenophon records that in 401 BC, when Cyrus the Younger marched against Babylon, the city was governed by King Syennesis in the name of the Persian monarch. At this period the patron god of the city was Sandon, of whom a large monument existed at Tarsus at least until the 3rd century AD. Coins showed Sandon standing on a winged and horned lion, and it is now thought likely that the Lion of Saint Mark on the pillar in the Piazza San Marco in Venice was in origin a winged lion-griffin from such a monument at Tarsus. Alexander the Great passed through with his armies in 333 BC and nearly met his death here after a bath in the Cydnus. By this time Tarsus was already largely influenced by Greek language and culture, and as part of the Seleucid Empire it became more and more hellenized. Strabo praises the cultural level of Tarsus in this period with its philosophers, poets and linguists. The schools of Tarsus rivaled those of Athens and Alexandria. 2 Maccabees (4:30) records its revolt in about 171 BC against Antiochus IV Epiphanes, who had renamed the town Antiochia on the Cydnus. The name did not last, however, due to the confusion of so many cities named Antioch. At this time the library of Tarsus held 200,000 books, including a huge collection of scientific works. In 67 BC, Pompey, after crushing the Cilician pirates, subjected Tarsus to Rome, and it became capital of the Roman province of Cilicia. To flatter Julius Caesar, for a time it took the name Juliopolis. It was also here that Cleopatra and Mark Antony met and was the scene of the celebrated feasts they gave during the construction of their fleet (41 BC). In William Shakespeare's 1606 play Antony and Cleopatra (Act 5, Scene 2), after Antony's death Cleopatra says she is going to Cydnus to meet Antony, i.e., she will commit suicide to meet him in the afterlife; "Go fetch / My best attires: I am again for Cydnus, / To meet Mark Antony"
In the Roman period, the city was also an important intellectual centre, boasting its own academy. One of its leading disciples, the philosopher Athenodorus Cananites, was the tutor of the first Roman emperor, Augustus, a fact which secured continuous imperial patronage for the city. When the province of Cilicia was divided, Tarsus remained the civil and religious metropolis of Cilicia Prima, and was a grand city with palaces, marketplaces, roads and bridges, baths, fountains and waterworks, a gymnasium on the banks of the Cydnus, and a stadium. Tarsus was later eclipsed by nearby Adana, but remained important as a port and shipyard. Several Roman emperors were interred here: Marcus Claudius Tacitus, Maximinus II, and Julian the Apostate, who planned to move his capital here from Antioch if he returned from his Persian expedition. Tarsus was the city where, according to the Acts of the Apostles, "Saul of Tarsus"[Acts 9:11] was born, but he was "brought up" ([Acts 22:3]) in Jerusalem. Paul was a Roman citizen (Acts 21:39; Acts 22: 25-29) "from Tarsus in Cilicia, a citizen of no ordinary city". Saul became Paul the Apostle after his encounter with Christ (Acts 9:11; 21:39; 22:3), and he returned here after his conversion (Acts 9:30). After about eight years, Barnabas retrieved him from Tarsus to help with the work in Syrian Antioch (Acts 11:25). Already by this time a Christian community probably existed, although the first recorded bishop, Helenus, dates only from the 3rd century. Owing to the importance of Tarsus, many martyrs were put to death there, among them Saint Pelagia of Tarsus, Saint Boniface of Tarsus, Saint Marinus of Tarsus, Saint Diomedes, Saint Quiricus and Saint Julitta. The city remained largely pagan, however, up to the time of Julian the Apostate (r. 361–363), who reportedly planned to make it his capital. Following his death during his campaign against Sassanid Persia, he was buried next to the city walls, opposite the earlier tomb of the Tetrarch Maximinus Daia. Emperor Justinian I (r. 527–565) undertook public works in the city, altering the course of the Cydnus river and rebuilding the bridge. Towards the end of his reign, the city suffered from riots of the Blues hippodrome faction. A cave in Tarsus is one of a number of places said to be the location of the legend of the Seven Sleepers, common to Christianity and Islam. The first recorded bishop of Tarsus, Helenus, went several times to Antioch in connection with the dispute concerning Paul of Samosata. Le Quien mentions twenty-two of its bishops, of whom several are legendary. From the 6th century, the metropolitan see of Tarsus had seven suffragan bishoprics (Échos d'Orient, X, 145). The Greek archdiocese, again mentioned in the 10th century (Échos d'Orient, X, 98), has existed down to the present day, as part of the Patriarchate of Antioch. At about the end of the 10th century, the Armenians established a diocese of their rite; Saint Nerses of Lambron was its most distinguished representative in the 12th century. Tarsus is included in the Catholic Church's list of titular sees as a metropolitan see of both the Latin, the Maronite and the Melkite Catholic Church. the exegete Diodorus, teacher of Theodore of Mopsuestia and consequently one of the fathers of Nestorianism. Nicholas of Tarsus, who was exiled about 525. Following the Muslim conquest of the Levant in the 630s, the city came first into contact with the forces of the Rashidun Caliphate. It is unclear when the town was first captured by the Arabs, but it is clear that it, and the wider region of Cilicia, remained contested between the Byzantines and the new Caliphate for several decades, up to the early 8th century. According to the Muslim sources, during his retreat the Byzantine emperor Heraclius (r. 610–641) deliberately withdrew the population and devastated the region between Antioch and Tarsus, creating an empty no man's land between the two empires. 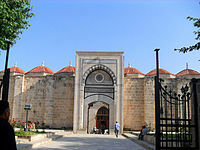 It was not until the early Abbasid period that Tarsus, by then lying in ruins, was once more reoccupied and refortified, this time as an advanced strongpoint within the fortified zone of the al-ʿAwāṣim, stretching from Tarsus northeast to Malatya, and as an assembly centre for expeditions against the Byzantine Empire. The first attempt was undertaken by al-Hasan ibn Qahtaba al-Ta'i in 778/9, but it was apparently unsuccessful, and the city was not fully restored until 787/8, by Faraj ibn Sulaym on the orders of Caliph Harun al-Rashid (r. 786–809). 3,000 Khurasanis and 2,000 Syrians (a thousand each from Antioch and al-Massisa) were given houses and land in the new fortress city. Tarsus was apparently recovered by the Byzantines soon after, at some point at the turn of the century. The city probably remained in Byzantine hands during the Abbasid civil war of the Fourth Fitna, but returned to Muslim control by 830, when Caliph al-Ma'mun (r. 813–833) recommenced offensive campaigns against Byzantium, using the city as a base. Henceforth and until the Byzantine reconquest in the 10th century, Tarsus was one of the main centres for the holy war (jihād) against Byzantium, comprising annual raids (ṣawāʿif) into Byzantine lands through the Cilician Gates when the mountain snows had melted and passage was possible. These were mounted by the local garrisons, maintained by the taxation not only of the frontier zone of the al-ʿAwāṣim but also by generous subsidies from the caliphal government, and large numbers of volunteer warriors of the faith (mujahidun or ghazis). Tarsus remained under direct Abbasid control until 878/9, when it and wider Cilician border zone were granted to the autonomous ruler of Egypt, Ahmad ibn Tulun. The local governor Yazaman al-Khadim returned the city to the direct allegiance to Baghdad from 882 on, but was forced to recognize the Tulunids again in 890. Tulunid possession of the border zone lasted until the death of Ibn Tulun's heir Khumarawayh in 896, after which Caliph al-Mu'tadid (r. 892–902) re-asserted direct control. The area remained under Abbasid rule for the next four decades. After a brief period where the border zone was under Ikhshidid control, in 946/7, Tarsus recognized the overlordship of the Hamdanid emir Sayf al-Dawla of Aleppo, who had become the new master of northern Syria and of the Byzantine borderlands. Facing a resurgent Byzantium, he was able to stem the tide for a while, but in 965, the Byzantine emperor Nikephoros II Phokas (r. 963–969) captured the city, ending Muslim rule there. Throughout this period, the governors of Tarsus also operated an active mint in the city. The terms of surrender of the city allowed any Muslim who wished to leave with as many of his possessions as he could carry. Many of those who left eventually settled, according to al-Muqaddasi, at Baniyas. Most of those who remained behind became Christians, and the local main mosque was either torn down or turned into a stable. The city remained under Byzantine rule until 1085. It was thereafter disputed between Latin Crusaders, Byzantines (1137–72), Seljuk Turks, and the Armenians of the Armenian Kingdom of Cilicia (Kingdom of Lesser Armenia). These last became definitively masters until about 1359, when it was captured by the Ramadanids with Mamluks. Finally, the area was brought under the control of the Ottoman Empire by Selim I in 1516. In the Middle Ages Tarsus was renowned throughout the Middle East; a number of Arab writers praised it as a beautiful and well-defended city, its walls being in two layers with five gates and earthworks outside, surrounded by rich farmland, watered by the river and the lake. By 1671 the traveller Evliya Çelebi records "a city on the plain, an hour from the sea, surrounded by strong walls two-storeys high, moated on all sides, with three distinct neighbourhoods inside the walls". Under Ottoman rule, it initially formed part of the Eyalet of Aleppo. After the Ottoman conquest of Cyprus in 1571 it became seat of a sanjak (sub-province) within the Cyprus Eyalet, before being transferred in 1608 to the sanjak of Adana as a kaza (district). Despite its excellent defences, Tarsus was captured from the Ottomans in 1832 by the Mamluks of Ibrahim Pasha of Egypt, son of Muhammad Ali, and for 8 years remained in the hands of the Egyptians, who began growing cotton on the surrounding plain. Upon the return of the Ottomans this cotton drove a substantial growth in the economy of the area, due to increased world demand for the crop during shortages caused by the U.S. Civil War. A new road was built to the port in Mersin and the city of Tarsus grew and thrived. Still today many large houses in the city stand as reminders of the wealth generated during this period. However, after being a port for 3,000 years, by the end of the 19th century neglect resulted in Tarsus no longer having access to the sea, and the delta became a swamp. At this point Tarsus was a typical Ottoman city with communities of Muslim Turks, Christian Greeks and Armenians. At the founding of the Turkish Republic in the 1920s the swamp was drained and the River Berdan was dammed to build Turkey's first hydro-electric power station. Irrigation, roadworks and a railway brought the economy of Tarsus back to life, with new factories, particularly producing textiles. The local cuisine includes: chargrilled chicken; hummus; şalgam (pickled turnips); tantuni (a sandwich of grilled meats); the tiny pizzas (lahmacun) called "fındık lahmacun"; and cezerye (a confection made out of carrots). As of 1920, Tarsus was producing cotton, and had two cotton spinning mills with over 26,000 spindles. Tarsus has two football statiums, Tarsus City Stadium and Burhanettin Kocamaz Stadium, and an arena, Tarsus Arena. Local football club is Tarsus Idman Yurdu. Cleopatra's Gate – to the west of the city, the only ancient city gate still standing, where Antony and Cleopatra entered the city in 41 BC, though the "restoration" of this structure has involved covering much of it over with shiny new stone (see  for a picture of the gate before the work was done). The Roman bridge of Justinian over the Berdan River. It is still in good condition. Tarsus Museum, containing lots of ancient coins and a severed mummified arm. Kızlar Kalesi, a Medieval castle ruin. The St. Paul's Church and well (it is now a museum, but occasionally Christian services can be performed there). ^ a b Bosworth, C. E. (1992). "The City of Tarsus and the Arab-Byzantine Frontiers in Early and Middle ʿAbbāsid Times". Oriens. 33: 269. ISSN 0078-6527. JSTOR 1580607. ^ Edwards, Robert W., "Tarsus" (2016). The Eerdmans Encyclopedia of Early Christian Art and Archaeology, ed., Paul Corby Finney. Grand Rapids, Michigan: William B. Eerdmans Publishing. pp. 569–570. ISBN 978-0-8028-9017-7. ^ a b c d Foss, Clive (1991). "Tarsos". In Kazhdan, Alexander. The Oxford Dictionary of Byzantium. New York and Oxford: Oxford University Press. p. 2013. ISBN 978-0-19-504652-6. ^ Eusebius, Ecclesiastical History, VI, xlvi; VII, v.
^ Oriens christianus, II, 869-76. ^ "CATHOLIC ENCYCLOPEDIA: Tarsus". newadvent.org. ^ Michael the Syrian :89]]. ^ Mical the Syrian :102. ^ Michel Le Quien , Oriens christianus (ex Typographia Regia, 1740) p1467. ^ Micahel Le Quien p1467. ^ Bosworth, C. E. (1992). "The City of Tarsus and the Arab-Byzantine Frontiers in Early and Middle ʿAbbāsid Times". Oriens. 33: 269–270. ISSN 0078-6527. JSTOR 1580607. ^ a b c Bosworth, C. E. (2000). "Ṭarsūs". The Encyclopedia of Islam, New Edition, Volume X: T–U. Leiden and New York: BRILL. pp. 306–307. ISBN 90-04-11211-1. ^ Bosworth, C. E. (1992). "The City of Tarsus and the Arab-Byzantine Frontiers in Early and Middle ʿAbbāsid Times". Oriens. 33: 271–273. ISSN 0078-6527. JSTOR 1580607. ^ Bosworth, C. E. (1992). "The City of Tarsus and the Arab-Byzantine Frontiers in Early and Middle ʿAbbāsid Times". Oriens. 33: 273–274. ISSN 0078-6527. JSTOR 1580607. ^ Bosworth, C. E. (1992). "The City of Tarsus and the Arab-Byzantine Frontiers in Early and Middle ʿAbbāsid Times". Oriens. 33: 270–271. ISSN 0078-6527. JSTOR 1580607. ^ Bosworth, C. E. (1992). "The City of Tarsus and the Arab-Byzantine Frontiers in Early and Middle ʿAbbāsid Times". Oriens. 33: 274–276. ISSN 0078-6527. JSTOR 1580607. ^ Bosworth, C. E. (1992). "The City of Tarsus and the Arab-Byzantine Frontiers in Early and Middle ʿAbbāsid Times". Oriens. 33: 276–278. ISSN 0078-6527. JSTOR 1580607. ^ Miles, George C. (1957). "Islamic coins from the Tarsus excavations of 1935-1937". The Aegean and the Near East, Studies presented to Hetty Goldman. New York. pp. 297–312. ^ Stern, S. M. (1960). "The Coins of Thamal and of Other Governors of Tarsus". Journal of the American Oriental Society. 80 (3): 217–225. doi:10.2307/596170. JSTOR 596170. This page is based on the Wikipedia article Tarsus, Mersin; it is used under the Creative Commons Attribution-ShareAlike 3.0 Unported License (CC-BY-SA). You may redistribute it, verbatim or modified, providing that you comply with the terms of the CC-BY-SA.